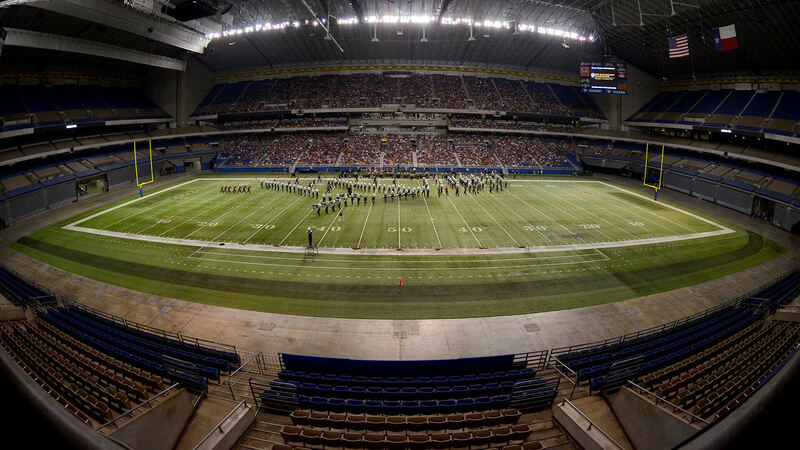 All 22 of Drum Corps International's World Class corps will be competing at the same competition on the same night, as the focus of the DCI Tour descends squarely on San Antonio for the DCI Southwestern Championship presented by Fred J. Miller, Inc. If you can’t be at the Alamodome on Saturday, you can catch all of the action online via the DCI Live! streaming video platform. Three Open Class corps and one international corps will join the full slate of World Class performances on Saturday. The webcast will kick off at 2:30 p.m. ET/11:30 a.m. PT, with the first of the 26 competing corps stepping off at 3:17 p.m. ET/12:17 p.m. PT. If you’re watching on DCI Live!, get comfortable--coverage of the all-day competition will continue past the midnight hour in the Eastern Time Zone. PLEASE NOTE: This DCI Live! webcast will be available for viewing on desktop computers, with mobile streaming available exclusively through the DCI.org iPhone and iPad app, or the DCI.org Android app. The webcast can be accessed as part of a season-long subscription package or pay-per-view. Last year, fans likely had an inkling that the Blue Devils--in the midst of their undefeated run--might be headed toward a championship title. This year, no one can be so confident. Scores have been a roller coaster ride all season, and while the Blue Devils remain at the top, they have competition in the likes of the Cadets and Bluecoats, with Carolina Crown and Santa Clara Vanguard also hot on their heels. San Antonio will mark just the second time that all five of those corps have met this season, and while it certainly won’t be the last, the competition is sure to be fierce. Meanwhile, the Blue Knights have been quietly ascending in the West, posting scores that would position them right behind the heavyweights in the East. On Saturday, the Blue Knights will finally join that pack, competing for the first time with all five of the corps above them in the standings. Already on pace for one of their best finishes ever, BK may still be looking to move up. You may have noticed how jumbled up the corps seem to be in San Antonio’s lineup, with several performing earlier or later than many might have expected. This is in part because of the system used to determine the lineup: Based on previous scores, the corps are grouped into sections of three, and then each of the three corps in each section are randomly drawn to perform first, second, or third within that group. But the lineup also says a lot about how competitive the 2015 Tour has been across the board. Just because a corps is placed higher or lower in the performing order doesn’t mean that’s where they’re going to finish. But it also doesn’t mean you should rule out that possibility. Check in early to see the Open Class corps compete--you don’t want to miss this lineup. Saturday will be one of the last opportunities to see the Guardians and the Louisiana Stars. 2015 is the second year for both corps, and both have extended their tours from last year. After performing at the Alamadome on Saturday, their seasons will both come to an end on Monday in Texas and Louisiana until next year. After the Guardians, Louisiana Stars and the final Open Class corps, Genesis, stay tuned to DCI Live! to watch Jubal help bridge the competition from Open to World Class. Jubal, which is based in Dordrecht, the Netherlands, has toured stateside before, most notably to celebrate its centennial in 2011. The Dutch corps will be performing at select events throughout the summer, and plans to the stay in America through the DCI World Championship Finals in Indianapolis. Help DCI give Jubal members a warm welcome as they return to the U.S. It's anyone's guess how the DCI Southwestern Championship will shake out. With all 22 World Class corps competing together for the first time, anything could happen, and you won't want to miss a second of the action on DCI Live!.